It’s like walking on water. Or as close as I am going to get to it in this earthly life. I have been a performance enthusiast all my life. From jogging shoes, wake boards, bicycles, cars to jets. Performance is an accepted blending of compromising aspects to obtain an optimum balance of output. You may have to give up some of one thing to get some of another. That is what I was looking for when I contacted Nauticraft about a human powered watercraft (HPW). I was not looking for a toy. I wanted a performance craft. The Nauticraft Escapade has the right performance balance. As I moved from the athlete days of my youth to my sixties I have had to accept some compromises. In the last few years I have been a kayaker and a recumbent trike rider. When I moved to Lake Harding in rural Alabama a couple of years ago I lost the ability to ride my recumbent trike because of nothing but country roads with no shoulders, not to mention the texting and driving issues. So; that left the Kayak. That’s fine for the day of “planned” occasional recreation, but I’ve learned that if you really want to go every day and exercise consistently – it has to be convenient! Both those previous pursuits required “dressing” for the occasion. When I go out in the Escapade I put on three things – water shoes, cotton shorts and sometimes a tee shirt and get in the boat and go. I don’t get hot spots in my feet from clipless bike shoes. I carry one; but don’t have to wear a life vest all the time as I do in a kayak. You can stop and rest, eat lunch, and even get out and swim and get back in with ease. It is much more stable than any boat of its size. Although my experience with the Escapade is limited to fresh water lakes, I have had no problem with four foot boat wakes and have been out in 30 mph winds and white caps. Sometimes in the ocean, you can never have a big enough boat. I am sure the Escapade will do well there; within reason. So the performance question everybody always asks is “how fast is it?” It is not like the boats you see in most water parks. It is a real performer. My normal cruising cadence is one revolution per second of the foot crank. That equates to 5 feet per second or about 3 1/2 miles per hour over the water in still wind and no current. That’s about twice what I did in a kayak. It’s about as fast as the average person would jog! That is a great compromise between hull resistance, propeller design and propulsion linkage. The twisted belt propulsion system is simple, maintainable and as corrosion resistant as you can get. Seat ergonomics and adjustment are just right. I am almost as comfortable in the Escapade as I am in my living room chair. I have done extended rides of several miles and been out for hours. Take your kids or your dog with you if you desire. In case you were thinking this is just for younger folks – I am a 64 year old, 6’1″, 250 lb. male that has had major back surgery. 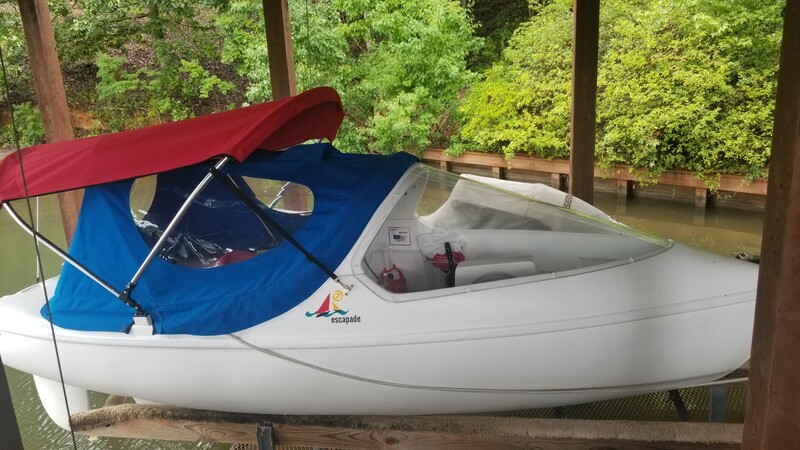 Although the Escapade can be a recreational craft for any age, I can tell you it is an exceptional “fun” exercise vehicle for anyone as well. 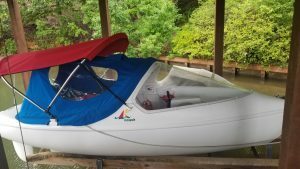 Especially, if you live on a lake – forget your walking gear, your bike, stair stepper or your kayak – get an Escapade or any of Nauticraft’s other craft that meet your needs. What are the cons? Very few. The keel gives it great stability in the water, similar to a sailboat, but it’s not suited for flat beaching. That’s a small compromise for stability. The plexiglass windscreen has a lot of glare to it. It would be impractical to make it from glass and most of the glare issue can be solved with a pair of Polaroid sunglasses. It is removable if desired. The windscreen arch could use some kind of in-molded hand holds to help with egress. I wanted to be able to use mine all year around, all weather, so I had a folding full enclosure canopy made. I enjoy being out on rainy days. For fair weather only, it is available with a Bimini top. If you are looking for a “performance” PWC, you can’t go wrong with the Escapade. Well the boat is in the water again and we didn’t have any trouble at all. Of course I took extraordinary measures to store it including taking out the drive units, taking out the cushions, the battery and lubricating all plastic on plastic moving parts with some silicone along with taking it out early enough last fall so that it had plenty of time to dry. Before I put them in I adjusted the drive units and lubricated them also. It didn’t really take that much work to store it this way and I think if I continue to do it each year it should last forever. Here’s to a good year. 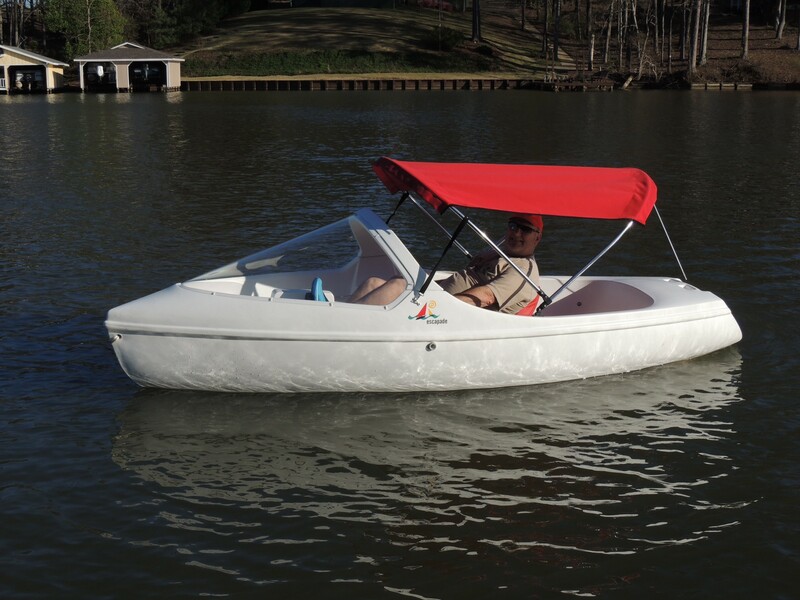 We love our Nauticraft Encore Pedal boat! In 1977, my wife and I bought a lake house in Maine. We enjoyed going out on the water in our canoe and enjoyed the early morning and evening quiet of the lake and the wildlife. We purchased a paddle boat and enjoyed taking our children for rides around the shoreline. However, the slap slap slapping of the paddles were an irritation for me. Eventually the drive mechanism would start to clank as we worked the pedals. I would try to tighten the drive mechanism, but it would always become noisy. We gave away our paddle and bought a more expensive one in the hope that it would not be as noisy. But to no avail, they all became noisy. About four years ago, we saw a neighbor’s Encore Pedal boat. We were amazed by how quiet and smooth it was. It also had room for two passengers and the workmanship was of the highest quality. Now there was a boat that had all we wanted! Our neighbors were kind enough to let us use it. It was awesome! So this year I ordered one for my wife’s Mother’s Day present. It was shipped UPS freight and the packaging was also well designed. Now we quietly travel the lake in style with our grandchild. Thank you Nauticraft for building such a wonderful boat. After performing a few more little tweaks, the boat (Escapade) was ‘as smooth as silk’ today. A real pleasure to operate and underneath the windshield, very warm. All the best to the whole company and thanks for making “the most beautiful boat in the world”. We loved our Escapade the moment we saw it and our love affair only got stronger with each passing season we put on this marvelous little craft. It is a joy to pilot and even easier to repair if that need should arise (hey it is a mechanical devise, it is bound to need help every now and again). It is so simple and easy to diagnose any issue as it is a very simple drive system. They made getting to all the parts very convenient and easy. Truly an outstanding design. This company has really out-performed our every expectation, from the craft to the staff on up to the owner of the company, Curt. This is one of the best run nautical manufacturers in the industry. The boats are so easy to customize and so fun to do so. One of the coolest parts about our boat is that it does not make a sound and animals come right up to it. In the San Francisco Bay, where my wife has logged not hundreds but thousands of hours in her boat, sea lions would follow her as if to say they approve. Now that we are living in South Florida, everything from Manatees, spotted Eagle Rays, to sea turtles and even hammerhead and bonnet head sharks come right up to the boat. There are a pair of dolphins that live in our waterway that we call, Frick and Frack, that are very curious about this boat, often following us around. We take our dogs out to the local islands here to run around and they too enjoy the peaceful ride of the Escapade. People from all walks of life want to know where we got this and could I get them one. I plan on buying a few more simply to rent to folks. If you are even toying with the idea of getting one, don’t give it another thought, these little boats are WELL worth the money and the people behind the scenes are an amazing bunch of people who are willing to give you the service you deserve. A great company from the keel up to the captain. It’s the most popular watercraft at the dock! I have owned a Nauticraft Escapade for three years and it is a fabulous little boat. 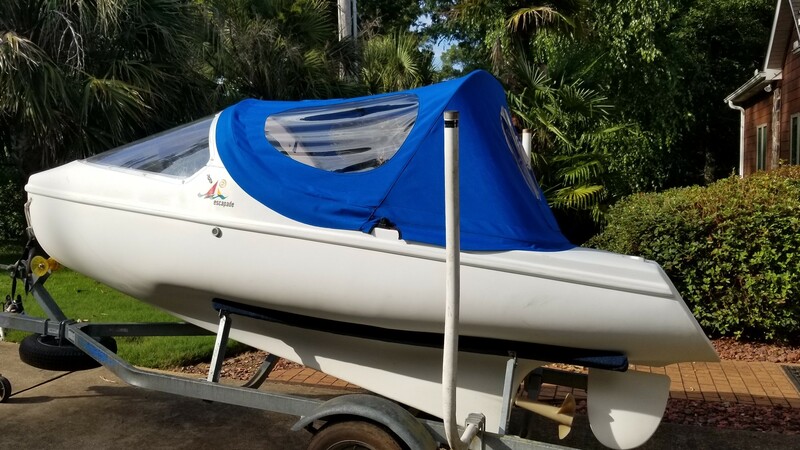 When I was in the process of ordering it, each and everyone at the company was incredibly helpful as we discussed models and selected features for the boat I finally ordered. Delivery went smoothly, and I was guided through the minimal assembly that needed to be done. Maintenance has been easy and the helpful online videos and parts ordering have been made easy by Mary Davis and the Nauticraft team which deservedly takes great pride in their work. The staff is accessible and responsive to all of my questions. The boat has been so much fun to use for all of my friends and family. It is truly the most popular watercraft at the dock! It is great exercise and also very stable for young and old. It is a terrific fishing platform. It is easily winterized and disassembles quickly for storage. The boat is thoughtfully designed and has given all of us much pleasure. We all love it!! We got our Escapade in the water today and I was out for a 20-minute pedal – ahhhhhhhhhh, it was wonderful – all systems go. We don’t own a convertible, but I can imagine how great it must feel with the top down cruising on a beautiful sunny day. And mostly I don’t even have to look where I’m going. I find pedaling the Escapade to be therapeutic – both physically and mentally, and dare I say, spiritually. We absolutely love the Encore! We are thrilled with the Encore….what a great design and product! We were able to cruise and enjoy the scenery while getting some exercise! We took an ice chest with snacks, swam off the platform and enjoyed a champagne sunset electric cruise! Thank you all for the nice reception and assistance in picking up our boat! I purchased a Nauticraft Encore electric boat about 5 years ago. It runs great on our lake. What I want to comment on is the post purchase service that the Nauticraft people provide. I have called with questions on operation several times and have gotten prompt and knowledgeable help. I highly recommend doing business with this firm if interested in electric and or pedal boats. She arrived safely and is in the river. We are delighted – what a fantastic product! It is getting a lot of use and attracting a lot of attention. There is nothing like it over here! Since 2013, my entire family & I have had the pleasure of owning and operating the Escapade. It has been a source of great pleasure especially for my grandchildren who range in age from 6 yrs – 11 yrs old. All safely operate the boat with a parent or a grandparent in the passenger seat. Nauticraft has been a great source of help and information when minor issues have arisen. And the on-line videos are clear and helpful when minor adjustments need to be made. I heartily recommend Nauticraft’s line of boats for anyone interested in wonderful family fun! Dear Mary and the rest of the Nauticraft team! Thank you so much for the wonderful Encore! Personally I really like the boat ESCAPADE. Very maneuverable and fast. The ENCORE model perfectly fits the profile of our customers (families of 2 adults and two children, also for older people who want a quiet experience). I am a cyclist and my Escapade is like having a recumbent bicycle that rides on the water. I like to take it out on Lake Michigan and ride up the coast for hours. It is comfortable enough for long trips and the Bimini top provides shade from the summer sun. When it gets too hot, I can jump in and cool off. Sometimes, I travel close to shore, and other times, I travel off shore about a mile, since the boat is very seaworthy. This is a great, low-intensity, complement to cycling on land. I can’t believe how fast it goes. It’s so easy to pedal and maneuver around. Makes me feel like a kid again. I just want to keep playing! I just love these little boats! If anyone is considering an nontraditional pedal boat for fun, pleasure, nature-enjoying, or even transportation if that somehow is a need for you, I highly recommend checking out Nauticraft as an option. The model I purchased is no longer available (Sprite), but there are two other, larger, multi-seat models (Escapade and Encore) available, both of which require trailers. These are boats built for comfort, speed, and just plain enjoyment. UPDATE from Nauticraft. The original Sprite is no longer available. But it has been replaced with an updated version. Additional information on that boat can be found via our website. Pedaling is less strenuous than a regular pedal boat, yet it goes much faster. Steering is amazingly tight and responsive, though I think I would have preferred a steering wheel rather than two levers. The comfortable seat is made of a foam material covered in vinyl, and it can very easily be adjusted forward or back to match the size of the user; removing it entirely is a snap. The best pedal boats I have ever seen or used. There was a short piece written about them in Recumbent News a few years ago as I recall. In any event these are expensive, but really top grade boats. Well designed with unbelievable performance. Several years ago the guy who developed them took one to Newport, RI to the Small Boat Show and challenged all others to a race that was out to a buoy and back. Kayaks, sea skiffs, shells, you name it, all entered the competition. The Nauticraft handily beat the field. Then one of the guys in a shell wanted to try it. He was an Olympian and could not believe this goofy pedal boat with a fat guy in it beat him. He bested his own time over the course by almost 1 full minute on his first attempt. We’ve had a great time with our Encore Electric boat this summer. No Regrets!! Thanks for a great product. The Escapade absolutely exceeds all promises! If you want to be outside and exercise on the water and work on your tan, get a boat from Nauticraft…sure it’s pricy, but so are Doctors and weight loss programs and DIABETES. You know, if you more than like something. Because truth be told I love this boat called the Escapade and I love the people who bring it to market. Dollar for dollar, the Nauticraft product is one of the finest, hand crafted products made in the good old USA. If you’re thinking about getting a Nauticraft, think no longer. Buy it! You’re bound to love it. I bought my Escapade in the spring of 2001 as a 50th birthday present to myself. I named my pedal boat RiverSong, and now; as my 12th boating season begins, I still love it as much as ever. Thank you again for the amazing service. I feel like part of your family there at Nauticraft and I love that. We love the boat. It’s the talk of the lake. It’s a beautiful boat. Runs nice and smooth. Lots of fun. I am happy with it! Wow, this really goes. It’s so responsive. Turns on a dime! This is a “just enough boat” – what a great time! You are to be commended not only for a superb design, but also for exceptional craftsmanship. It is fantastically relaxing as well as exercising. It is interesting to note that its speed in rough conditions is about the same as it is under calm conditions. One of the best things about going out is hearing everyone tell me how “cool” the boat is and wondering where I got it. I want to thank you very much for the excellent customer service and support you’ve provided. I am a very happy and satisfied customer! We’re having a ball with it here at Hilton Head. It really catches everyone’s eye. Good looks – a good way to relax and still exercise. I like it’s looks, aerodynamic shape, efficient drive train – simplicity of design, and durability of rotomolded plastic. It’s seaworthy, good when the wind blows, built well and able to steer easily. It is the talk of the lake. Room Enough for the Dogs! People just LOVE them. We had 2 adults, 2 kids and 3 poodles in one, and they came back dry and happy. I am having a ball with my boat! I pedal it every day to a different location on the lake. We are very happy with our Encore Pedal boat. Alot of thought went into the design. It is very comfortable, easy to pedal & very maneuverable. It did not seem to matter whether the water was calm or rough – or whether we had 1 or 4 people – the boat handled the same.